Cartesian Platform Production : Zmation, Inc. There are situations where a customer is moving quickly to get to market before its competition. When a prototype is delivered it is not uncommon to start building the production equipment before the prototype has been proven out. 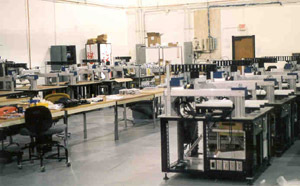 This is an example of a large CARTESIAN automation platform build. The customer was under such tremendous time pressure the production equipment was in fabrication while the initial prototype was still being tested.